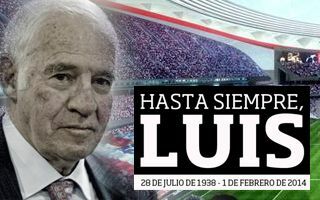 As sad news of Luis Aragonés's passing reached fans of Atletico, the initiative to honour the legend in new stadium's name is gaining momentum very fast. Former player and manager of Atletico Madrid, Luis Aragonés passed away today, losing his fight against leukaemia. Recently the one behind Spanish national team's trophees, Aragonés was undoubtedly most famous among Atletico fanbase, having played 265 games and taking over the team as coach six times. Within hours of his passing, the idea of honouring Aragonés with his name at the new stadium in east Madrid began growing and already reached impressive size. Hundreds of replies at the most important messageboard, Colchonero.com, and now over 2,500 fans of the initiative on facebook, too. As the support grows, Atletico isn't addressing this proposal yet. Any decision is unlikely to come soon as emotions are still too high. Los Indios also need to consider potential naming rights consequences, should the name of Aragonés be approved for Estadio la Peineta.